An upper respiratory tract infection (URI or URTI ) are conditions that are caused by an acute infection that involves parts of the body’s upper respiratory tract. These parts include the nose, sinuses, pharynx or larynx. These illnesses include tonsillitis, laryngitis, sinusitis, otitis media or the common. Rhinitis is inflammation of the nasal mucosa. Rhinosinusitis or Sinusitis: Inflammation of the nose and paranasal sinuses, this could be ethmoid, frontal, maxillary and sphenoid. Pharyngitis – inflammation of the tonsils, uvula hypopharynx, pharynx. Epiglottitis (supraglottis) Inflammation of the superior portion of the larynx and supraglottic area. Laryngitis Inflammation of the larynx. Tracheitis Inflammation of the trachea and subglottic area. The symptoms can be sore cough throats, nasal congestion, runny nose. Sneezing, facial pressure, and low-grade fever. The symptoms usually begin one to three days after a person has been exposed to the virus. The illness usually last 7- 10 days. Group A beta hepatic streptococcal tonsillitis or strep throat typically have a sudden onset or a sore throat, pain from swallowing and fever. Strep throat, however, does not cause a runny nose, cough or changes in voice. Pain and Pressure of ear caused by a middle ear infection due to otitis media and reddening of the eye caused from viral conjunctivitis that associated with upper respiratory infections. There are over 200 variations of different viruses that have been identified as causing URIS in patients. The most common virus is called the rhinovirus. 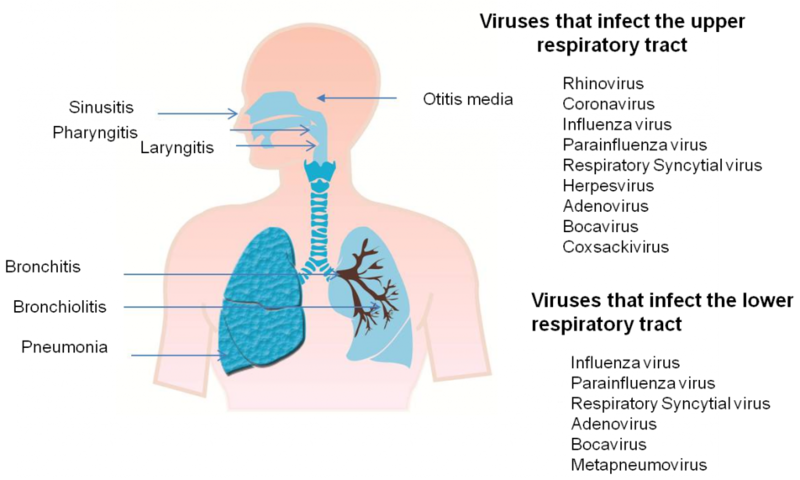 There are other viruses that such as the coronavirus, parainfluenza virus, adenovirus, enterovirus and respiratory syncytial virus, which is the leading cause of lower respiratory tract infections? Nearly 15% of acute pharyngitis cases can be caused by bacteria; this is due to Grop A streptococcal pharyngitis ( strep throat) There other bacteria viruses such as Haemophilus influenza, and Streptococcus pharyngitis. Probiotics can be helpful in preventing URTIS. It is also recommended that people receive vaccinations against URTI;s such as influenza viruses, adenoviruses, Rubella, Measles and Streptococcus pneumonia. The treatment option depends on the cause of the condition. Today there are not in drugs or herbal remedies that can shorten the duration of a URTI with conclusive data. Most treatments involve addressing the symptoms of the illness such as for headaches, sore throats and muscles aches. Moderates exercise in people who are sedentary, who have contracted an URTI does not help the overall duration and severity of the illness. However mild sleep deprivation has shown to be associated with increased risked of getting an infection. There have not been any randomized trials to ascertain if there benefits of drinking fluids, and lowering the risk of getting URTIs. Doctors can prescribe antibiotics which may be helpful to people who have a URTI or URI. However, there are adverse effects of using antibiotics. By wisely utilizing antibiotics, patients can use less of these drugs and increase the effectiveness, by preventing the likelihood of bacteria becoming resistant to certain antibiotics. This is a growing problem across the globe. World health authorities have started to encourage actively doctors to decrease the use of antioption’s to treat common upper respiratory tract infection because antibiotic usage does not significantly reduce the recovery time of these viral conditions. Some organizations are advocating the delayed use of antibiotic drugs to treat URIS, to minimize the consumption of antibiotics while attempting to maintain the level of care for patients. In some studies, there is evidence that there is no improvement in symptoms of those who are treated with antibiotics right away patients who are given delayed prescriptions. IN most studies there are not different in painting outcomes, satisfaction or patient complications. However, there is evidence people who have underlying lung diseases such as chronic obstructive pulmonary disease (COPD) do benefit from the early usage of antibiotic treatment for URTI or URIs, resulting in shortened treatment for illness and decrease risk for treatment failure. According to a Cochrane review, the usage of single oral dosages of nasal decongestants for the common cold can modestly improve the short-term relief of congested in adults. However, this data is inclusive for decongestant usage in children under 12 to help treat the common cold. Oral decongestants are contraindicated in people with coronary artery disease, hypertension, and bleeding strokes. The use fo vitamin can help improve the defenses of people who are exposed to cold environments or brief periods of severe physical exercise. Vitamin C is an inhibition and treatments for upper respiratory infections.